When it comes to good bars, the atmosphere is crucial. South Dakota’s one-of-a-kind bar options will surely give you an evening to remember. From swanky speakeasies to classic biker hangouts, here are the 10 best unique bars in the state! In the tiny remote town of Rochford in the Black Hills, Moonshine Gulch Saloon is a true hole in the wall for local bikers and hikers. The rustic bar embodies the saloon atmosphere with occasional live country music, cowboy decorations, and cozy interior. While the atmosphere is top-notch, the beers are even better! Nothing can beat sipping a refreshing brew while looking out over the surrounding Black Hills National Forest. The staff treat customers like family and are nothing but welcoming to locals and tourists alike. Head to Moonshine Gulch Saloon for an authentic South Dakota experience! For lovers of cold beer and long names, Monks House of Ale Repute and Gandy Dancer Brew Works (or “Monks” as the locals call it), is the place to be in Sioux Falls. With 39 constantly changing craft beers on tap, there is always something new to try. The atmosphere is also unique in that the bar allows dogs, has a festive outdoor patio, offers a pool table and pinball machines, and has a cozy fire going in the chilly winter months. Monks is a one-of-a-kind bar that has something for everyone. True to its name, the Loud American Roadhouse is a rowdy and loud bar in the legendary Sturgis. While the bar is flooded with customers during the rally, it stays busy the rest of the year as well! The iconic bar hosts events and concerts year round, making it a local gathering place for all the Black Hills and western South Dakota. Not only is the entertainment world-class, but the alcohol and food menus are both highly recommended. Order a shot of whiskey and get in the Sturgis spirit! This cozy and calming Sioux Falls hot spot is known for their crafted cocktails and tasty brews, not to mention the welcoming environment and patrons. With their trendy downtown vibe, the bar is busy yet not overwhelming. Drinks are reasonably priced despite the establishment being fairly upscale. You’re not going to want to miss the Carpenter Bar! Boar’s Nest is THE biker bar in the Black Hills. Come rally, it is overflowing with motorcycles and partiers. The bar is full of history; in fact, right behind the bar’s main building is a 118-year-old cabin built by settlers at the turn of the century. As the Hills moved from their pioneering past and into the current tourist and biker hotspot, the Boar’s Nest was formed. The rustic bar is as authentic as they come, and just walking through the doors is an experience in and of itself! Located in the upscale Rushmore Hotel in downtown Rapid City, the 445 Martini Lounge is as classy as it sounds. The relaxing atmosphere is complete with fire pits, views of the town through 360-degree windows, a modern and sleek vibe, and scheduled live music. 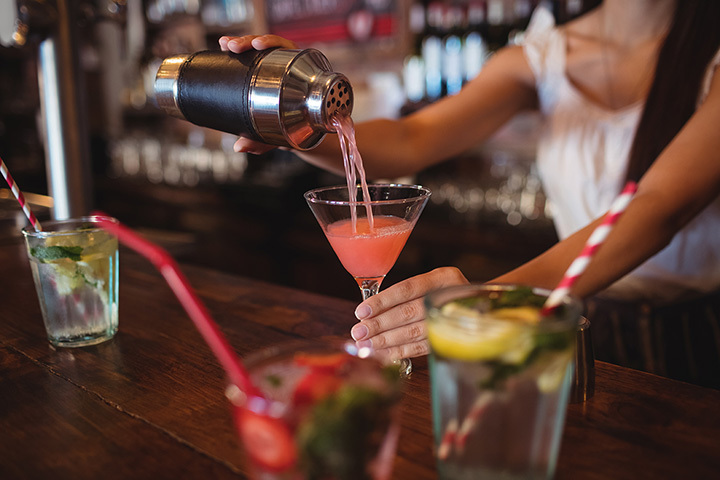 Their signature cocktails and other drinks are masterfully made, so make sure to give the 445 Martini Lounge a try when in Rapid City! Dempsey’s is a classic Irish pub, and there’s always a good time at this bar! Founded in 1999, this Watertown bar has been part of the community for decades and has won tons of awards for everything from their chili to their brews. They’re the second oldest brewery in the state, and serve a variety of craft beers. This trail blazing pub is one of the best in the state and is certainly a unique experience! PAve is the quintessential hip bar in Sioux Falls, from their modern and light environment to their unique drinks to the creative food menu. The specialty drinks are perfectly crafted and include favorites like Grafton Street Cider (Jameson Irish whiskey, lemon juice, sugar syrup, blackberry simple syrup, dash apple juice), Sinners and the Saint (Agave Loco tequila, Grand Marnier, Cointreau, orange juice, lime juice, and agave nectar), and Heart Breaker (Tito’s vodka, lime juice, simple syrup, Fee Brothers peach bitters, raspberries), among many other creative concoctions. In a quaint and rustic building in downtown Lead, the Dakota Shivers Brewing Company has been a town staple for many years. The atmosphere is incredibly welcoming and customers are treated like family. The little brewery serves up some of the best craft brews in the hills in a quaint little bar! Arguably the swankiest bar in the state, the Blind Lion speakeasy is hidden at an undisclosed location in downtown Rapid City and even requires a password to get in. The bartenders, dressed in 1920s fashion, serve up a huge array of drinks, all served with a smile. Even the patrons get in on the fun and the establishment is full of patrons dressed like flappers and slick gangsters. Blind Lion is as fun as it is secretive!